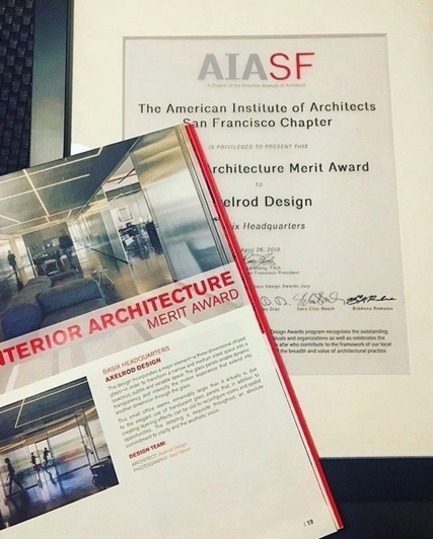 Leading architecture and interiors firm Axelrod Design was celebrated at the annual American Institute of Architects San Francisco 2018 Design Awards with an evening gala awards ceremony at the Herbst Theatre, San Francisco. The awards announcement drew hundreds of the region’s leading architects, designers and building professionals, to an elegant reception led by master of ceremonies, San Francisco city architect Edgar Lopez, AIA, and music by the San Francisco Conservatory of Music. 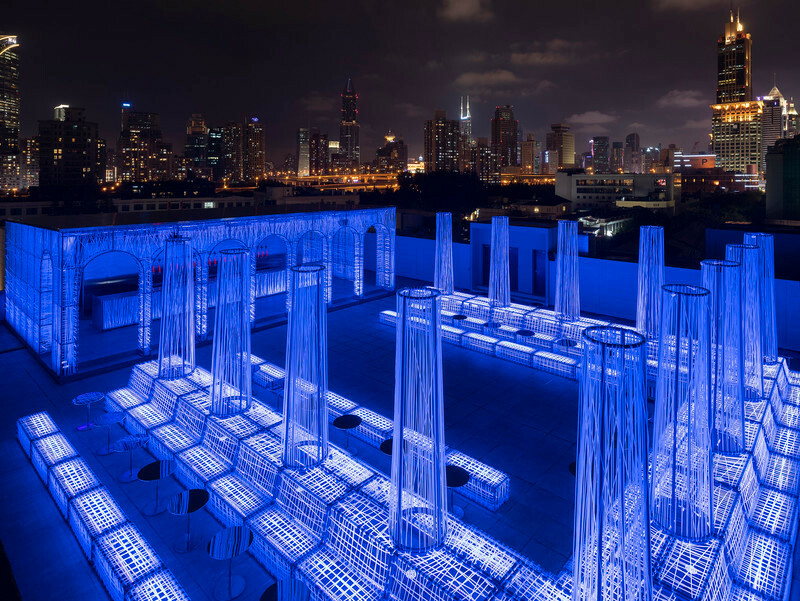 More than 19 world-class projects from across the architectural spectrum were recognized for Architecture, Interior Architecture, Unbuilt Design and Social Responsibility. 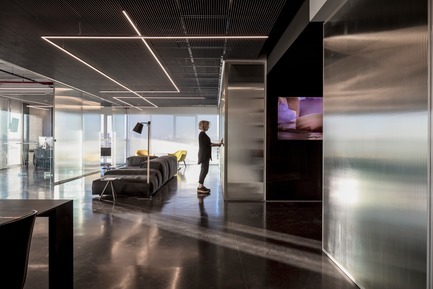 Designer Irit Axelrod accepted the AIA SF 2018 Merit Award for Interior Architecture for her Basix HQ project in Tel Aviv. 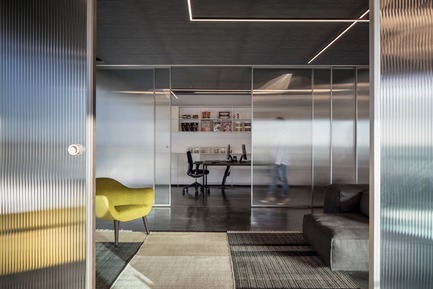 Irit Axelrod designed the office interiors for the new Basix company headquarters in Tel Aviv. 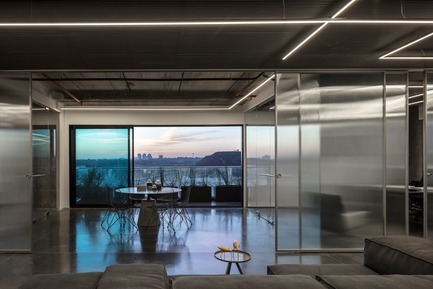 Axelrod Design/Axelrod Architects is based in San Francisco and Tel Aviv. She lives and works in both locations, and has completed notable residential projects in the Bay Area. 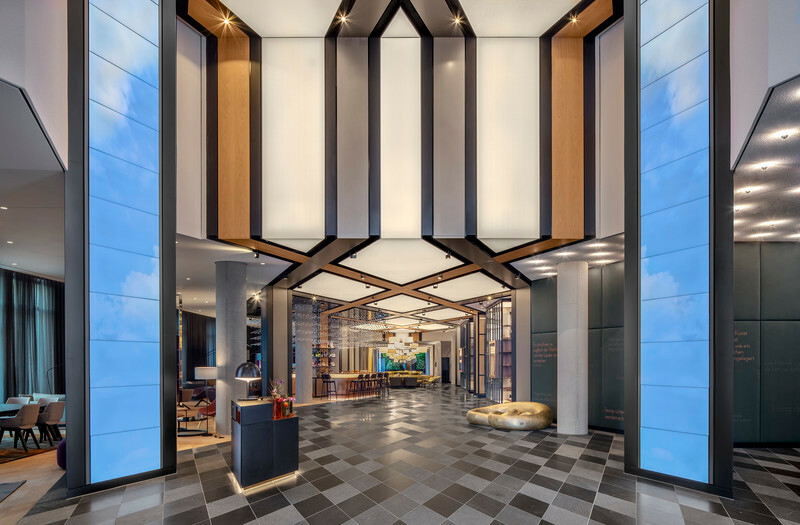 She often works in both locations on residential, office and commercial projects traveling with her children in the ultimate global nomadic lifestyle. 2500 sq. ft., 250 sq. 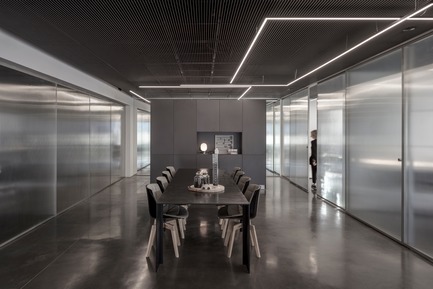 m.
Axelrod Design/Axelrod Architects designed the interiors for the Basix office headquarters, a company that imports and distributes quality raw materials for the food industry in Israel and abroad. 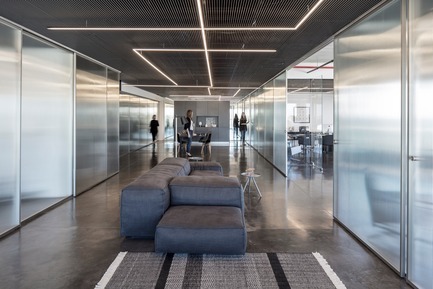 Based in Tel Aviv, the company prides itself on being a client-oriented organization with flexible, dynamic personal service and a core of solid professionals. 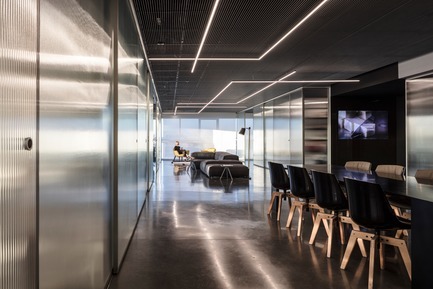 The Axelrod team translated these company values into a flexible, dynamic office design. 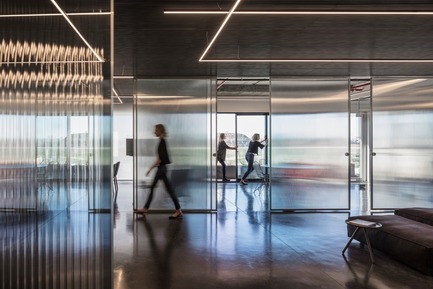 The new interior design incorporates a major element—three-dimensional striped glass—in order to transform a narrow, medium-sized office space into an open, subtle and expansive one. 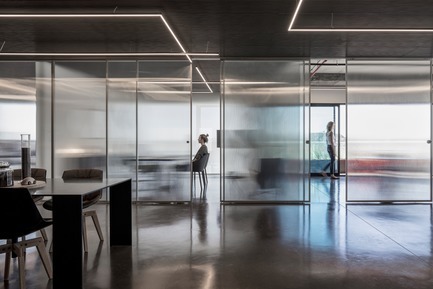 The office has been divided by fixed and moving glass partitions to provide for the perpetual movement and changing combinations of today’s flexible office spaces. There is no definition of doors separate from glass partitions, and there is no unambiguous definition of openings. 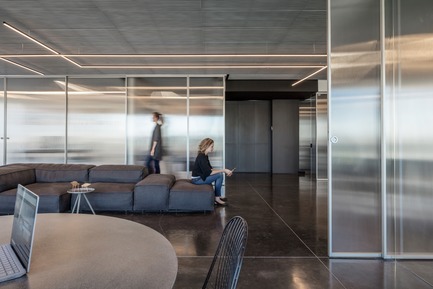 The partitioning elements slide across the polished concrete floor, exposing and concealing workspaces as needed and providing a changing outlook onto the skyline view outside, blurring the lines between public space, offices and balcony. 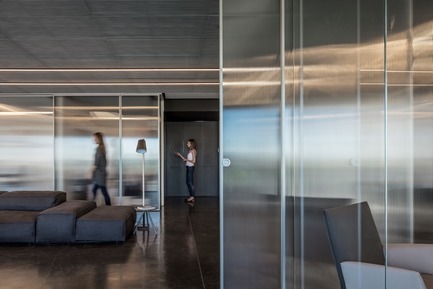 The narrowly shaped floorplate is configured to provide a main public space that serves as the spine of the office. 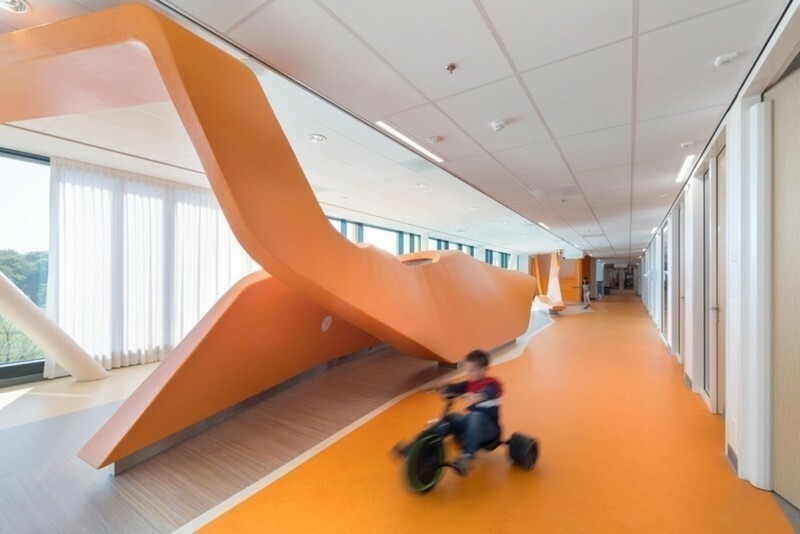 This public spine floats in the middle of the office space, including a seating area, kitchenette and a central meeting desk. 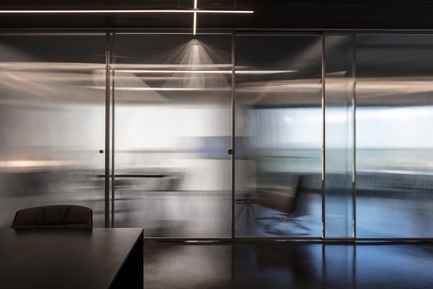 The sliding glass panels enable a dynamic transparency and intensify the experience of motion and light. 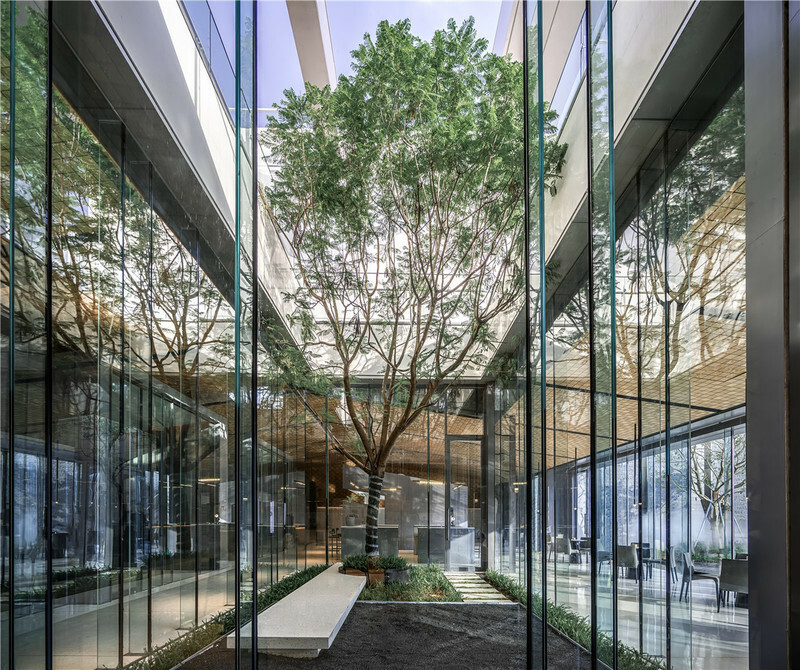 Extending the space by addressing views of the skyline beyond, the design also connects within, hinting at internal spaces seen through translucent glass panels. 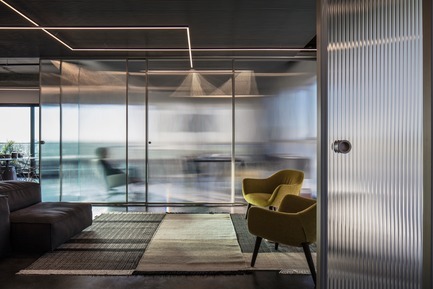 Like the changing light for a photographic exposure, the motion of the translucent striped glass, casts shadow and light against furniture placed in the space, and raw lighting fixtures correlate to the partitioning geometry. 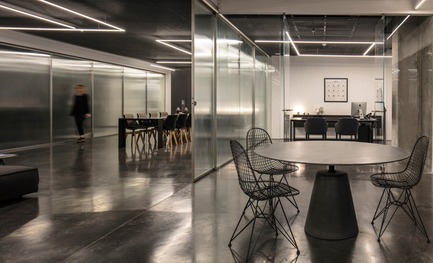 The interior design is redefined throughout the day by natural light and the movement of people across their workspace. Tel Aviv-born designer Irit Axelrod is making her mark across two continents. The designer is best-known for her love of raw unfinished concrete set in bold, geometric forms, celebrating an aesthetic pioneered by Le Corbusier in the 1940s. Axelrod is finding an audience of the aesthetic in her adopted home in San Francisco, as well as her native Tel Aviv. She owns and runs her architectural offices in both locations, splitting her time evenly between the two cities, and raising a family in San Francisco. Shortly after Tel Aviv-born Irit Axelrod graduated from the Faculty of Architecture in the Technion/Israeli Institute of Technology, she landed her first architectural commission, the Ben Gurion Heritage Institute building in south Israel. 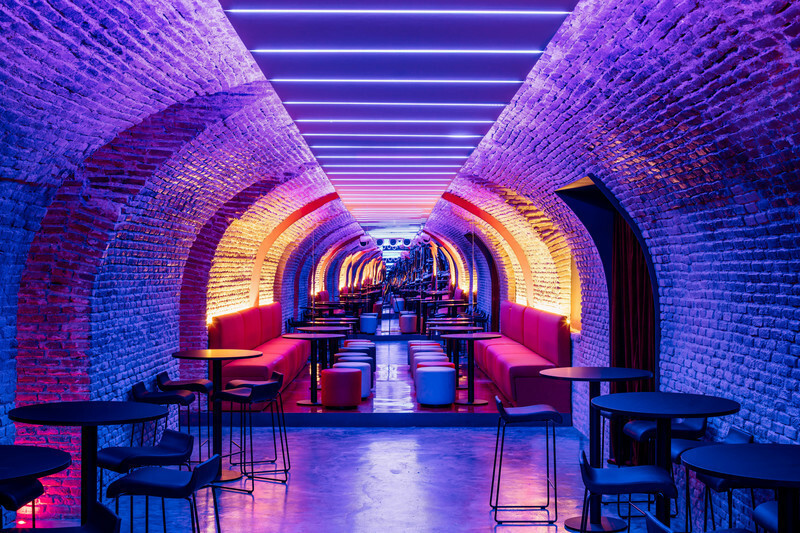 Twenty years later, Axelrod continues to bring her sense of “quiet power” to all her projects, now splitting her time between Tel-Aviv and San Francisco, where she set up her stateside office (Axelrod Design) in 2006. Growing up in Tel Aviv, Axelrod was surrounded by the city’s early 20thcentury, International Style architecture. The beauty of the buildings’ raw concrete construction, part of her daily experience, made a marked impression on her young life. The monolithic forms continue to influence her work today. The buildings, whose origins are rooted in the Bauhaus tradition, find expression in all her design commissions, including single-family residential, institutional and commercial. Axelrod Design has been featured in top international architectural publications, including Wallpaper*, Dwell and Architectural Record. Basix Headquarters, Tel Aviv. 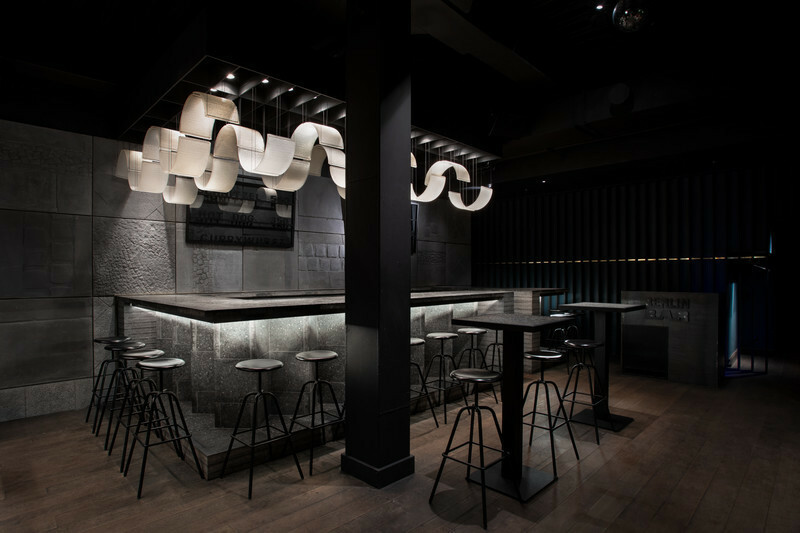 Interior Architecture by Irit Axelrod, Axelrod Design. 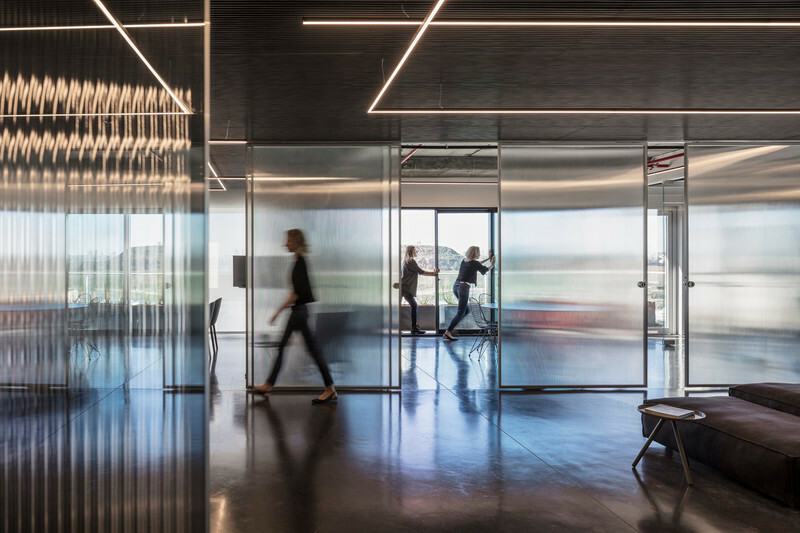 2018 AIA SF Interior Architecture Merit Award Winner. Irit Axelrod at Basix Headquarters, Tel Aviv. 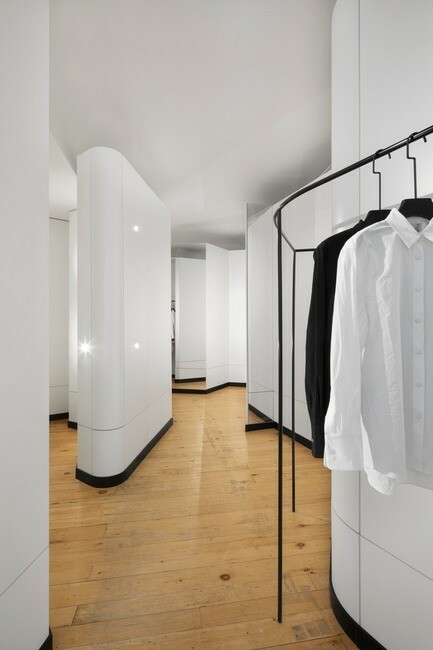 Interior Architecture by Irit Axelrod, Axelrod Design. 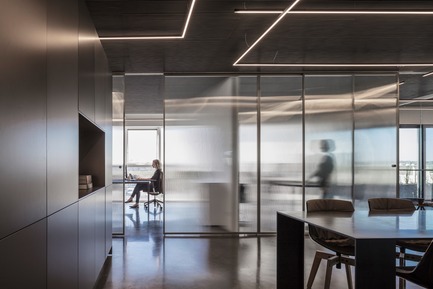 2018 AIA SF Interior Architecture Merit Award Winner.